"America, 2020. Three young hackers with nothing to lose. A secretive scientist with a plan. One final job. What happens when you're poor, angry, and get superpowers you never asked for? 'Skins' + 'Unbreakable' = GENERATION GONE." Meet Elena, Nick, and Baldwin. Three millennial hackers on the verge of a windfall end up getting more than they bargained when they come across a life-altering code. Ales Kot and Andre Araujo have placed their own spin on the superhero genre with an engaging and immersive new book, Generation Gone. The year may be 2020 but it's very current and timely in the topics the book touches on without being heavy-handed about it. This extended first issue offers over 50 pages of character development leaving the more sensational drama towards the end. The move pays off as we get to know these characters before things turn heroic. Each of the hackers have very different dreams. The three have been testing their hacking prowess by infiltrating the systems at DARPA poking around the scientific research facility. It's all a trial run before they try to milk a bank for millions of dollars. Unbeknownst to them, Dr. Akio is a scientist working on a surveillance program for DARPA but who's real passion is a pet project called Project Utopia. He explains in great detail through a power point presentation that he has theoretically found the coding that could unlock superhero abilities in humans. You can see where this is going. It would have been very easy for Kot to jump right to the hackers' transformation but instead he smartly continues to build on the group's dynamics exposing their idiosyncrasies and personalities. Elena is a hardworking student with two jobs who looks after her cancer-stricken mother. She's dating slacker Nick who's dickish and condescending to her. Baldwin is disciplined who relishes a routine and precision. It's a volatile mix of personalities at times which sets the table for some potential drama for when they become super powered. They have no idea what's in store for them as their only concern is hacking their way to a big payday. As for Dr. Akio, he's ruffled the feathers of his supervisors as they've grown impatient with his research. They're conceived his Utopia project has him distracted. Little do they know that his Utopia project and the hackers are about to cross paths with remarkable results. 'Generation Gone' is a slow burn story that's more interested in building a world full of people and not events. Kot lays out the perfect introduction to everyone involved that alone is intriguing and engaging. We can see how the story unfolds and where it's going but we become invested in who they are especially Elena. And at over 50 pages it's also one hell of a deal. Araujo is tasked with a lot of the heavy-lifting as his caption-less panels tell the story later in the book. There are visual cues that say a lot with nary a word. The world these young people navigate is grounded to real problems. Expensive cancer treatment, school loans, police brutality, financial issues, toxic personal relationships and the use of technology. Araujo uses plenty of detail and deliberate pacing with wonderful color schemes from Chris O'Halloran that are understated and soft but effective. The art is clean and smoothly choreographed. 'Generation Gone' is a surprisingly fresh superhero story that is rooted in the here and now with relatable characters whose motivations are clear. It recalls the film "Chronicle" with young people on the verge of attaining superhuman powers. It'll be their character that defines the kind of hero they will be and that is what makes this so fascinating. At times predictable but with such a well executed beginning you'll want to know what happens next as soon as possible. 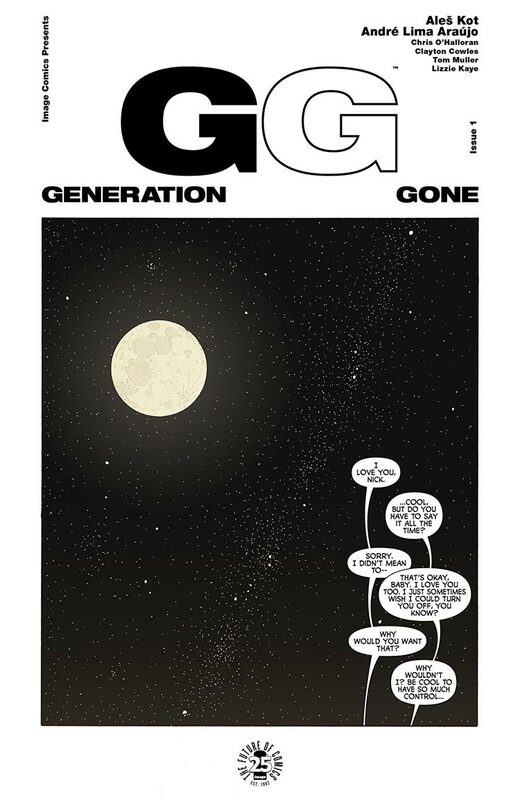 'Generation Gone' is worth adding to your pull list.